Going to school and looking for a part time job of at least 20-30 hours a week? Or you may want to be one of our full time team members and become part of a dynamic team at an expanding business while having a blast? 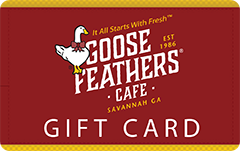 Then you need to join the crew at Goose Feathers Café located in historic Downtown Savannah at Ellis Square. We’re more than a great place to work. We’re your place for competitive wages and growth opportunities. This is your opportunity to get in on the ground floor and come along for the exciting ride while we expand the café across the Southeast. In business since 1986, Goose Feathers Café is a family-owned-and-operated café and bakery. At Goose Feathers Café, we care about the quality of our food and our reputation among our patrons, so we take pride in hiring only the best employees. Become a Station Trainer and share the secrets of a happy Café & Bakery with new employees. Become a Key Team Member, and be an essential “go to” person for your Goose Feather teammates. Become a Shift Leader, and help direct everyone’s talents and energies with the Cafe. Become a Floor Tech and keep the Café sparkling while meeting all the customers. Or become part of our kitchen staff and fill our patron’s tummies with joy! They’re all great jobs and you’ll have a good time discovering what you’re made of, and your raises are up to you and your ability to multi-task. The higher you go up the Café’s Station ladder the more money you can make. We also offer discounts on meals, great hours (no evenings), and we are closed on most major holidays. There’s so much waiting for you at Goose Feathers Café, we invite you to stop by and talk to us. Have a Whoopie Pie. Feel the warmth of the cafe. Get a little taste of what we’re all about. From great food to awesome opportunities, we’ve got so much to talk about. See you soon!